Originally discovered by the East India Company Captain Keeling in 1609 on a journey from Bantam it seems to have developed both names of Cocos and Keeling. The Cocos refers to the latin name for coconut (cocos nucifera) which seemed to grow with ease on the islands and were a welcome source of fluid for thirsty sailors. 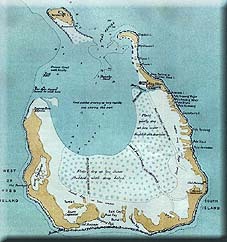 Captain Keeling actually named just one of the islands after himself and gave the atoll the name Cocos. He transcribed it as Cocos-Keeling Atoll. So the confusion over the names has been going on for about 400 years now. Settlement had to wait until the Nineteenth Century. The first inhabitants were as a result of a shipwreck of the Mauritius in 1824. They were lead by Captain Le cour. They were rescued by Captain Driscoll of the Lonarch in 1825. The fact that they could have survived for so long demonstrated the viability of the atoll as a possible base for settlement. The following month, on on 6th December 1825, Captain John Clunies-Ross, a Scottish trader sailing the Borneo for Alexander Hare's company, made a brief landing on the islands - actually by accident. Originally he had intended to survey Christmas Island but the weather was to poor there and they could not land. During Captain John Clunies-Ross's visit he sounded the main channel, cleared on area on two of the islands and planted vegetables and cereals. Encouraged by the Captain's reports, Alexander Hare arrived the following year with 100 other settlers. He set up a settlement on Home Island and subsidiary camps on most of the other larger islands. The following year he was joined by Captain John Clunies-Ross who brought his family and a small party of servants, seamen and tradesmen. Disagreements between the two leaders and financial troubles for Alexander Hare meant that Alexander signed over ownership to John Clunies-Ross and Alexander left for good. With perseverance and diligence, John Clunies-Ross slowly built up the settlement and turned it into a profitable enterprise - mainly by trading coconuts, coconut oil and copra with the settlements in Java. Further opportunities were afforded by the increasing number of whaling ships resupplying in the island - although drunken crews could cause havoc on the small community. John turned to the British Governor for help in establishing the rule of law on the islands and a Royal Navy sloop was despatched to set up a code of law. In 1845 John died but he passed his estate on to his son John-George Clunies-Ross. In 1857, the private possession of the Clunies-Ross' would accidentally pass formally into the British Empire. The reason for the bureaucratic mistake was that the British had assumed that the possession was an East India Company asset. As a direct consequence of the Indian Mutiny in 1857, all East India Company assets were taken over by the crown. Including the accidentally listed Cocos Islands. Little changed on the islands except that John-George Clunies-Ross became governor instead of proprietor. Administratively the islands were moved about. In 1878 they were attached to Ceylon's jurisdiction. Eight years later they changed their minds and moved it to the Straits Settlement. Although Queen Victoria did grant the Clunies-Ross family ownership of the islands in perpetuity. At the turn of the century, the islands became a vital communications hub as a telegraph relay station and its strategic value rose as a result. This actually became a problem in both world wars as the islands became a target. The successful German surface raider the Emden was famously attacked and scuttled on the islands by HMAS Sydney in 1914. In World War Two, the islands were virtually at the front line as the Japanese took the nearby Christmas Island. The Allies built a huge airbase and extensive defences in case of invasion. 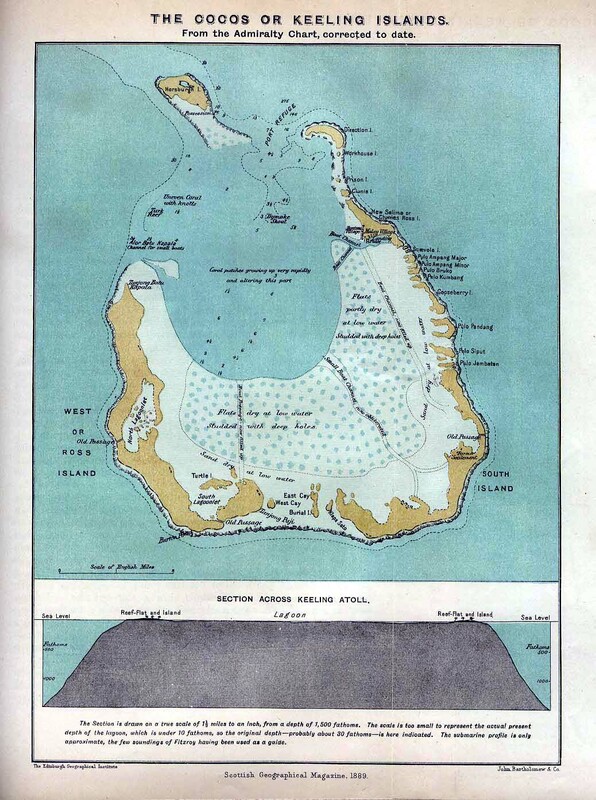 Having said that, a mutiny occurred on the islands by Ceylonese soldiers who were stationed there to guard one of the radio and telegraph stations. On the night of May 8th, a dozen soldiers led by Bombardier Gratien Fernando attempted to take over the island and hand it over to the Japanese. They were advocates of Ceylonese independence and assumed that the Japanese would be more willing to grant this than the British. The mutineers were only prevented from achieving their goal when a bren gun jammed at just the wrong moment for them. Three of the mutineers, inculding Fernando, were hanged at Welikdada Prison in Colombo in 1942. These were the only three British and Commonwealth soldiers executed for mutiny during the entire Second World War. In 1955 the jurisdiction of the islands was changed once more from the Straits Settlement to Australia. In 1978 the Australian government formally bought the islands from the Clunies-Ross family. Six years later the islands officially joined Australia. 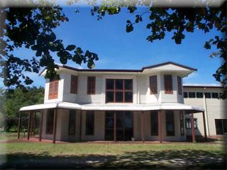 This site discusses all aspects of the history of the islands.